The Airbus A340 is a large widebody aircraft for long-range flights. 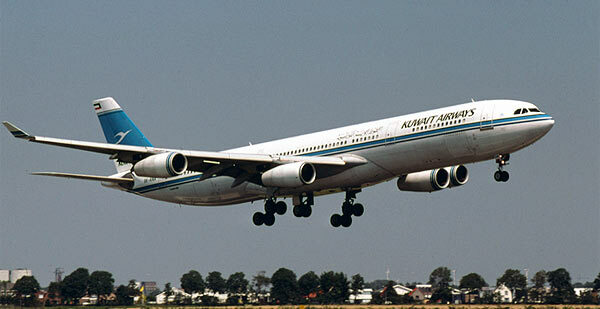 Airbus launched the A340 in June 1987 in parallel with the A330, as a single aircraft program: the A340 with four engines and the A330 with two. The A330 was most suitable for medium range sectors and the A340 for the very long range. 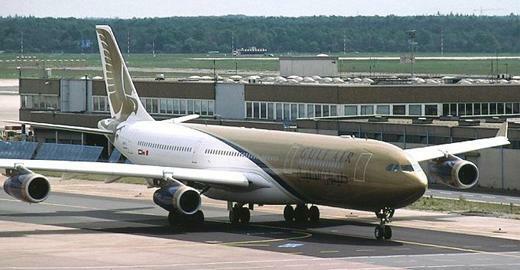 The A340 is a competitor of the McDonnell Douglas MD-11 and the Boeing 777. For the four-engined A340 it was not easy for Airbus Industrie to find a suitable engine. The CFM56 came closest to the needed thrust, but actually was not powerful enough. In 1986/1987 International Aero Engines (IAE) offered the SuperFan and Airbus Industrie considered using it in the A340. The SuperFan was an ultra-high bypass version of IAE's V.2500 engine, one of the powerplant-choices for the Airbus A320. There was a lot of commotion in the aviation world these days about the so-called 'propfan' in these days, a turbofan concept with very high bypass ratio and without a nacelle. The propfan promised to be much more fuel-efficient than traditional turbofans. The SuperFan was a mix of the traditional turbofan and the propfan. It had the wide blades of the propfan but still the nacelle of the turbofan. IAE didn't proceed with the new engine, however. In the meantime CFM International had developed a more powerful version of the CFM56 and in April 1987 Airbus Industrie decided to fit this engine on the A340. One of the reasons to develop a 'quad' in addition to the A330 twin was that a twin needs more excessive power to be able to fly with one engine out. The heavier an aircraft is, the more powerful the engines must be and when a twin loses an engine, the whole weight must be carried by the sole remaining engine. A twin looses 50 per cent of its power after an engine-failure, a quad only 25 per cent. Also, for the situation of one-engine out, the tail can be smaller on a four-engined aircraft, which saves weight and results in less drag. Because the A340 would operate into and out of smaller airports, a third main undercarriage leg was installed. The A330 and A340 have carbonfibre tailplanes, containing fueltanks. On ultra-long routes crew members need rest during the flight. The A340 is therefore fitted with a special crew rest area. The A340 flew for the first time on 25 October 1991 and in March 1992 it entered service with Air France and Lufthansa. During the 1990s Boeing and Airbus were competing heavily on range with their 777 and A340 respectively. To counter the growing range of the 777 Airbus developed two new versions of the A340: the A340-500 and the A340-600. The manufacturer went ahead with the project in December 1997 and Virgin Atlantic became the first customer. The A340-600 is 11.70 m longer than the A340-300 and became even a few meters longer than the 747. The two-wheel centre main undercarriage bogie of the A340-300 was replaced by a four-wheel leg. The CFM56 was not powerful enough for such a big plane and therefore Airbus installed the Rolls-Royce Trent 500 instead. The wing of the A350-500 and -600 has a 20 per cent bigger area than that of the A340-300. The A340-500 is less stretched but has the biggest range of the two airliners. The aircraft can fly non-stop routes like Singapore-New York. Singapore Airlines started flying on this route as soon as the aircraft became available. The A340-600 was aimed as replacement for early Boeing 747s and the first real threat for the hegemony of the Jumbo Jet. The first airlines buying the A340-600, like Virgin Atlantic, Lufthansa and South African Airlines indeed replaced older 747s with the new aircraft. The A340-200 is the basic variant of the A340, seating 263 passengers in three-class layout. Almost identical to A340-200, the -300 has a longer fuselage and seats 295 passengers. In 1996 a higher weight variant of the -300 entered service with Singapore Airlines. This variant has more powerful engines and a strengthened wing. The A340-300E is an enhanced version which incorporates new technology from later projects. The A340-8000 is a very long range version, with increased weights and more fuel capacity. Only one aircraft has been built, which is in service as a VIP aircraft (VIP=Very Importans Persons). In December 1997 Airbus officially launched two new A340 variants: the A340-500 and the A340-600. Both variants have a 20 percent larger wing area, more fuel capacity, more powerful engines (Rolls-Royce Trent instead of CFM56-5C) and longer fuselages compared to earlier versions. 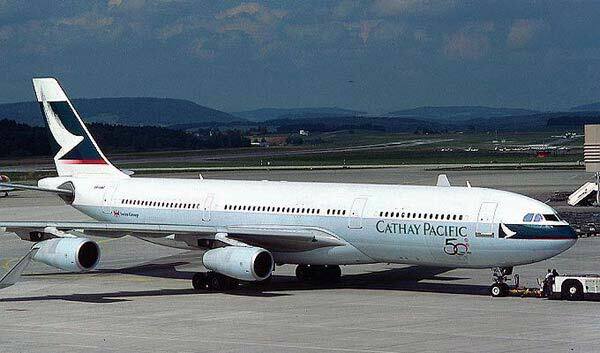 The A340-500 is an ultra-long-range version, which flew for the first time on 11 February 2002. The A340-600 is the longest passenger aircraft in the world. With a length of 75,30 meter it is almost 5 meter longer than the Boeing 747 Jumbo Jet and it is also almost 3 meter longer than the Airbus A380 'Super Jumbo'. The first flight was in April 2001 and the first production aircraft was delivered to Virgin Atlantic in July 2002. The proposed A340-400X was a 6.3 m longer version of the A340-300 with uprated CFM56 engines. Airbus dropped this version in favour of the more radically improved A340-500 and A340-600.